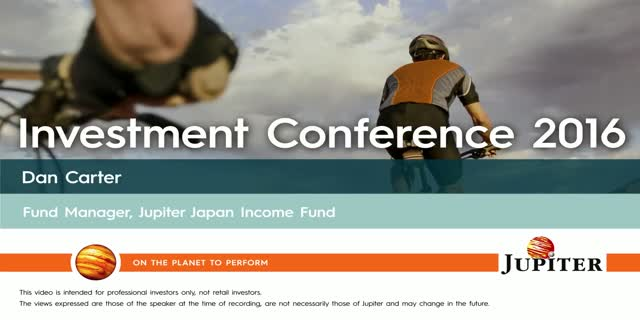 Dan Carter, manager of the Jupiter Japan Income Fund, discusses his presentation on the theme of endurance and resilience. James Clunie, Head of Strategy, Absolute Return will explain how the portfolios are currently positioned and how he plans to evolve with the market conditions rather than acting pre-emptively. James joined Jupiter in 2013. He is currently Head of Strategy, Absolute Return. Before joining Jupiter, James worked at Scottish Widows Investment Partnership as an Investment Director of equities, and managed a long/short equity fund and UK long-only funds. James was a senior lecturer in finance at the University of Edinburgh between 2003 and 2007, prior to which he worked as Head of Global Equities at Aberdeen Asset Management and Director and Head of Asset Allocation at Murray Johnstone International. James gained a degree and PhD from Edinburgh University and is a CFA® charterholder. Join Talib Sheikh for an update on the Jupiter Flexible Income Strategy. Talib Sheikh joined Jupiter in June 2018 and is Head of Strategy, Multi-Asset. He manages the Jupiter Flexible Income fund (SICAV). Before joining Jupiter, Talib was managing director and portfolio manager at JP Morgan Asset Management where he has worked for nearly 20 years. He was instrumental in the formation and growth of the Multi-Asset Solutions team, since inception in 2004. Over this time, Talib has managed a number of products including multi-asset income, target return and flexible balanced funds plus diversified institutional accounts. Talib has an MSc in International Agricultural Marketing from Newcastle University and is a CFA® charterholder. Ariel Bezalel, Head of Strategy, Fixed Income, provides his latest quarterly update. Ariel Bezalel started his career at Jupiter and has been a member of the Fixed Income team since 1998 and a fund manager since 2000. He is currently Head of Strategy, Fixed Income. The Jupiter Merlin Portfolios are managed by the Jupiter Independent Funds team, consisting of fund managers John Chatfeild-Roberts, Algy Smith-Maxwell, Amanda Sillars, David Lewis and product specialist Alastair Irvine. In this webcast, the team will present their latest views on markets and fund choices for the Jupiter Merlin Portfolios. To watch the live webcast or access the replay after the event, please register. Please join the Jupiter Value Equities team for a live update on the Jupiter UK Value Strategy. Ben joined Jupiter in 2006 and is currently Head of Strategy, Value Equities. Before joining Jupiter, Ben worked at Schroders, managing both retail and institutional portfolios and around £2 billion of assets. Ben has a degree in Geography from Cambridge University. Dermot joined Jupiter in 2014 and is currently a Fund Manager in the Value Equities team. Prior to joining Jupiter, Dermot worked at Fidelity where he was a Building Materials Analyst. Dermot holds a BA in Commerce from the National University of Ireland, Galway. This video is intended for professional investors only, not retail investors. Ross Teverson, Head of Strategy, Emerging Markets, provides his outlook for 2019. Alejandro Arevalo, Fund Manager, Fixed Income, provides his outlook for 2019. Talib Sheikh, Head of Strategy, Multi-Asset, provides his outlook for 2019. Algy Smith-Maxwell, Fund Manager, Independent Funds, provides his outlook for 2019. Ariel Bezalel, Head of Strategy, Fixed Income, provides his outlook for 2019. Guy de Blonay, Fund Manager, Global Equities, provides his outlook for 2019. Jason Pidcock, Head of Strategy, Asian Income, provides his outlook for 2019. James Clunie, Head of Strategy, Absolute Return, provides his outlook for 2019. Cédric de Fonclare, Head of Strategy, European Opportunities, provides his outlook for 2019. John Chatfeild-Roberts, Head of Strategy, Independent Funds, provides his outlook for 2019. Edward Bonham Carter, Vice Chairman, Jupiter Fund Management plc provides his outlook for 2019. Dan Carter, Fund Manager, Global Equities, provides his outlook for 2019. Alastair Gunn & Rhys Petheram, Fund Managers, Multi-Asset, provide their outlooks for 2019. Jupiter's fund managers discuss their views on 2018 and provide their outlooks for 2019.